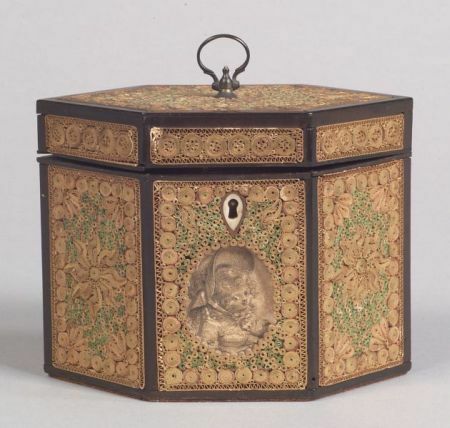 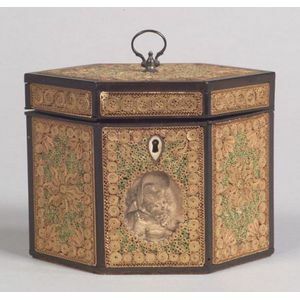 Georgian Paper Filigree Tea Caddy, early 19th century, hexagonal, the ebonized case covered with gilt, green and tan paper scrolls, lid with small metal handle, front panel with bone tear-drop shaped escutcheon, over central stipple engraved bust of a girl, ht. 4 7/8, wd. 6 3/8 in.